We all know U.S. Sen. Jim Inhofe thinks that climate-change science is a hoax, but does he believe air pollution is a hoax, too? 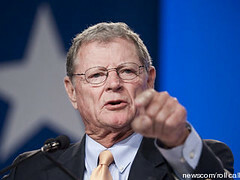 Inhofe, according to media reports, is trying to use the Congressional Review Act to stop new emission standards by the Environmental Protection Agency, arguing they will “bankrupt the coal industry.” According to media reports, Inhofe said the new rule will result in job losses, which doesn’t make basic sense because electricity has to be produced one way or another. We knew Inhofe was essentially a spokesperson for the oil and gas industry, but who knew he was such an ardent supporter of coal interests? His support of the coal industry actually collides with the interests of the natural gas industry. Some electric plants have converted coal turbines to natural gas turbines because gas is considered by some to be a cleaner energy source. The larger issue, though, is Inhofe’s apparent dismissal of air pollution. Mercury exposure in unborn children is linked to nervous system damage, and the EPA estimates that limiting mercury emissions will avoid 4,200 to 11,00 premature deaths. The regulations also limit emissions of sulfur-dioxide and fine particulate matter, which exacerbate asthma and other respiratory problems. Limiting sulfur-dioxide will even help plants breath easier, because it contributes to acid rain. None of that appears to matter to Inhofe. Inhofe’s effort to stop the rule was called “over the top” by U.S. Sen. Mark Pryor, an Arkansas Democrat, but Inhofe’s senate career has been defined by such extremism. What else is new, right? As I’ve written before, Inhofe gets away with his anti-science agenda at least partially because the corporate media in this state doesn’t appropriately investigate or critique his claims. Sure, The Oklahoman will run stories in which people criticize Inhofe’s actions, but the newspaper won’t hold him to a basic truth standard.